AUBURN – “Just call David Griffin” was the advice for people looking to store items in Auburn. “People in town always knew that, if you needed to store something, to call David Griffin, and you could put it in the barn,” said Janice Fusco, Griffin’s daughter. Griffin was a library trustee for many years and he provided library storage in his barn. Longmeadow Church also kept things in the barn. The rubber ducks used in the town’s annual duck race were stored in the barn until this year, according to Fusco. George Gould Griffin purchased the land in 1862, according to Dan Carpenter, president of the Auburn Historical Association. The 800 acres he bought went from Tower Hill in Candia and included Clark Pond and Little Massabesic Lake, and across Currier’s Point on Massabesic Lake. In the 1870s, his son, Willard – Fusco’s great-grandfather – was purchasing grain by the railroad car load to grind into flour. The Griffins owned a mill there and one on Clark Pond, and they owned shares in others – Dearborn Mill, Hook Mill and a mill in Hooksett, according to Carpenter. Willard also built the current house, which Fusco said is the third one placed on the property. The original house was moved from the property and another – the “green house” – replaced it before the current house was built. “I have Willard Griffin’s business records from the 1870s,” said Carpenter. “He was purchasing corn and other grain by the railroad car from the Chicago market. The grain would be ground into meal at his grist mill in Auburn.” Fusco said they also sold hay. “The hay hook is left,” said Fusco. “That is up in the rafters that they used to take hay off the wagons when they came in.” When selling off the contents of the barn, Fusco discovered an old weight scale. She said she remembers hearing a thunk of metal hitting metal, or a clang noise, when stepping on a certain part of the floor, but had not thought any more about it until discovering the scale. Its proximity to Griffin Dam also made the barn a popular background feature. “It is like a focal point because of the waterfall and stuff,” said Fusco. “There is a picture of the foliage and there is a picture of the barn on calendars and stuff. Many wedding pictures and prom pictures have been taken where the barn has been a backdrop.” Carpenter agrees that the Griffin barn was well-known in the town years ago. “There is an Auburn postcard showing Emery’s hay wagon at the Auburn store,” said Carpenter. 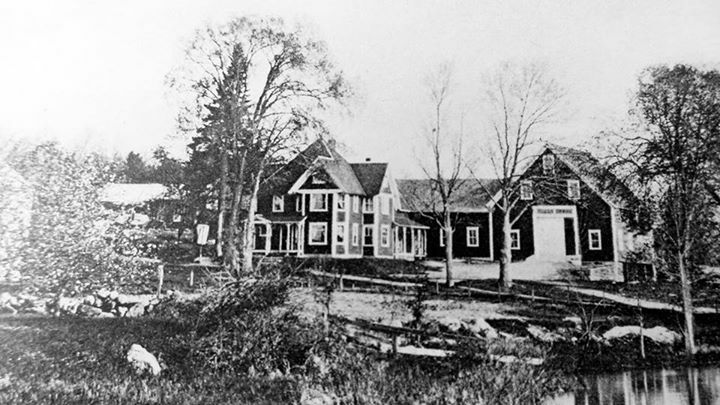 “Emery owned Oak Farm in Auburn Village. Everitt Seavey says the Emerys purchased hay from the Griffin farm behind what is now the Auburn Village School. It would be easy and convenient to weigh it at the ‘green house’ and proceed into the village to Oak Farm.” Fusco said the Griffin mill operated off the brook at Griffin Dam for years. “It was the center. There was a business always run out of it (the barn),” said Fusco. “They made barrels there at one point. They had a tool shop in the field and made shingles. They always had something going on there because of the brook. They moved logs down the brook.” It is Carpenter’s guess that the Pillsbury Company put the smaller mills out of business shortly after 1900, and the Griffins sold both of their mills by 1936, he said. John C. Porter from the UNH Corporative Extension spoke about the history of barns in New Hampshire on June 11, 2015. The history and style of the barns are shaped by the agriculture that was being produced over the past 200 years. Because of New Hampshire’s weather the barns were also built to survive the bitter cold winters. Unfortunately, many New Hampshire barns are now in a dilapidated condition because they are owned by widows who are unable to keep them in good shape due to the high upkeep costs. In the 1800’s, the barns were called English barns – barn styles were copied from ancestors brought over from Europe. These barns were generally small and grew over time as agriculture became more profitable. The English barns always had their doors facing the east side and in the middle of the barn. The 1850’s were the hay day of New Hampshire agriculture and the barns that were being built were called Yankee barns. Yankee barns had a steeper pitched roof, doors at the end of the barn as well as a cupola situated on top of the barn. The cupolas played a functional role as they were used for the ventilation of hay and in the cow stables. After the civil war, agriculture was profitable because a railroad was built that connected New Hampshire to the west. During this period, sheep and wool were also a huge industry and mills were being built along the rivers and producing wool products. About 90% of the barns in New Hampshire were used as cow barns; sheep were mainly kept in sheds. The Yankee barns had an open basement to the south of the barn and hay was stored on the main floor. During this time period, New Hampshire had many open fields and meadows and stone walls were used to keep the sheep and cows corralled. The next style of barns being built were Gunstock-style barns; named because the posts that hold the barn up are tapered gracefully at the top of the barn their signature indicator of a gunstock frame. Barns were made of several kinds of wood, including beech, chestnut, pine, spruce and white oak. The barns were built with clapboards on the street side and shakes on the other side of the barn. Very old barns were built with vertical boarding and often two layered. There were barns built that were attached to the houses and other barns. This allowed businesses such as the wagon repair shop, shoe repair shop and buggy shop all to be under one roof without going outside during inclement weather. There were Village barns being built. This barn was generally built for the family that had a driving horse, family cow and a few chickens. The logging industry built big barns for their draft horses. Starting in 1904, barns were being built in a round shape. The feed and grain was in the middle and the cows were along the outside of the barn. Usually these barns were 16 sided. In the 1940 - 1950’s the government introduced regulation for a clean stables in the barns and cows were required to stand on clean surfaces. These barns had a gambrel roof and concrete floors. In the 1970’s, barn owners were advised to abandon their old barns and build new ones with tresses. Today’s barns are being built for the hottest day in July and August and not the coldest day in February. Cows produce less in the heat of the summer than in the cold of winter. There is a barn assessment grant in place provided by the preservation alliance that offers tax easements for barns. It is called 97D, this benefits the barn owner if they would like to fix their barns up. AUBURN – Longmeadow Cemetery and the Auburn Village Cemetery have an extensive history that dates back prior to the incorporation of the town of Auburn. “We encourage people to walk the cemeteries and learn the history of the town and those people that came before us, also appreciating at this time of the year all of our veterans,” said David Jenkins, chairman of the cemetery trustees. The book “Auburn, New Hampshire” written in 1970 by Carl Cheswell Forsaith, has a lot of historical information on both the town and the cemeteries, according to Jenkins. Records show that, on May 5, 1793, the town voted that the “old meeting house was to be taken down and set on the ground near John Calef’s lot” and, on July 14, the Longmeadow Meeting House was moved to what is now known as the Longmeadow Cemetery. The house was located near the center of the present cemetery with the “burying ground” located in the back of the building. The first burial in Longmeadow Cemetery was that of Mrs. David Carr in 1796, and, according to Jenkins, soldiers from the Revolutionary War are buried there. The Longmeadow Cemetery Association formed May 1, 1908. At its first meeting, the association voted to purchase the cemetery from the Congregational Church for $1. The Auburn Historical Association maintained the cemetery until October 1979 when it was turned over to the town of Auburn. The Auburn Village Cemetery does not have such a clear history, but the Auburn Historical Association knows it had been donated to the town of Chester as a public cemetery before Auburn was incorporated. Although there is uncertainty about the first burial, it is believed to be that of Mary Hook, daughter of Samuel Hook and Judith Williams, in 1822. The two cemeteries had separate groups of trustees and were considered separate entities until about five years ago when they were put under a single board of trustees. In addition to Jenkins, Don Dollard and Scott Norris serve as cemetery trustees. Prior to the merger, David Griffin had served as trustee of the Auburn Village Cemetery for about 45 years, maintaining it until he was close to 90 years old. Likewise, Donald Stritch maintained the Longmeadow Cemetery for decades. Griffin kept the records for the Auburn Village Cemetery at his home until his death, at which time they were placed into the care of the town. Records for the Longmeadow Cemetery already were maintained at the town hall. Although the Auburn Village Cemetery is larger than Longmeadow, the Longmeadow Cemetery is older. Jenkins credits Don Dollard with many of the improvements to the cemeteries. “Don Dollard has worked countless hours remapping both the Longmeadow and the Village cemeteries, a project which has taken the better part of two years,” said Jenkins. Other recent improvements include the repair of more than 200 headstones, a project that is ongoing, and containing the overgrowth at both cemeteries. This year’s budget includes funds for re-roofing and painting the vault at Longmeadow and the removal of 11 trees along the property line, as well as placing a chain as a gate at each cemetery at the end of the season to help protect the roads during the winter months. People still will be able to enter the cemetery on foot during that time. BARN TALK “The History of Agriculture as Told by Barns”- The evolution of barn architecture tells the story of New Hampshire agriculture. Barns changed from the early English style, to Yankee style, to gambrel and then pole barns to accommodate the changing agriculture. This presentation will be a chronological walk through time, with photo illustrations of barns around the state that are examples of these eras of agricultural history. On Tuesday, May 19, 2015 the Auburn Historical Association and The Griffin Free Public Library organized a presentation of the Old Man of The Mountain. There were approximately 50 people in attendance eager to learn more about the state of New Hampshire’s emblem. Interesting facts were discussed about Franconia Notch and the legacy of the great stone face. The presentation was about one of the best known rock formations in the country formed about 14,000 years ago, “The Old Man of the Mountain.” His face once measured about 40 feet high and 25 feet wide. The Old Man was discovered in 1805 by surveyors working on the first road through Franconia Notch. The Franconia North Parkway is one of the most spectacular mountain passes between the Kinsman and Franconia mountain ranges. Cannon Mountain and the Flume Gorge are at the center of Franconia Notch where the Old Man once stood. The Old Man’s fame began mostly because of statesmen Daniel Webster and Nathanial Hawthorne’s writings. Through its many years of existence, this iconic rock profile had been secured numerous times in the attempt to prevent the rock profile from falling. The first attempt to secure the Old Man was in 1916 when the owners of The Profile House hired Edward Geddes to work on the forehead of the large stone. Geddes spent six days in frigid conditions installing turnbuckles and rods. Fiberglass was also used to fill in the cracks on the heard of the rock formation. For the last of the many years that the Old Man stood, the caretakers were Niels, Mike, Deb and David Nielsen. On May 3, 2003, shrouded in fog, the Old Man of The Mountain fell sometime between midnight and 2 a.m.
On June 12, 2011, a newly constructed Old Man Profiler Plaza and monument was dedicated in memory of the Old Man of the Mountain.